We wake up each day to our lives with Rheumatoid Arthritis which is a life of uncertainty and so much more. We only wake up to it if we were lucky enough to go to sleep that night since so many of us suffer with not being able to get any sleep at all due to the pain we endure. Yes, we are so happy to be alive and for that we are all so grateful. This is not a cry of selfishness or one of pity, this is our cry, a cry of reality in our walk with this disease. Has Rheumatoid Arthritis changed all that you’ve come to know in your life? Has it made you second guess any moves that you have attempted to make? It’s not a surprise if this is true. This is our life as it stands with this disease. We’re wishing for more control of all that we go through but it is out of our control. For many of us it’s like looking in a mirror seeing our reflection as we continuously repeat the ups and downs this disease brings while we turn away in hopes of things changing. Our cry is for much more than people may hear or see. We sometimes sit silently as we pray for relief, support, understanding, a better day or for the best thing of all “a cure”. Dare we hope to see that in our horizon. A cure that would end all we feel and we will suffer. Our cry as we struggle with Rheumatoid Arthritis is never meant to be any less than it is. Some take this journey as a walk through times that are not so complicated but our lives proves just how daunting and tasking this journey is. So as we struggle for anything that will make this life easier, we will also struggle to bring more awareness to a disease that many believe to be arthritis, the joint ailment. Yes, joint ailment I will call it is the least of a disease that is so mistaken for far less than it really is. Our disease is by far more debilitating, forever lasting, misunderstood and is an auto immune assassinator. This is what we wake up and face everyday and with it our fight is bigger and broader and we are fighting it from the inside out. Sure some of what we have is invisible but that’s only because our internal fight is what we are working harder to control to keep those visible signs at bay. This only makes our battle to be heard and understood more difficult. We are not a product of over the counter medication, we are forced to take medication that require many trials and tribulations, most with terrible side effects. Until the idea that RA is just arthritis is out of the mind-set of people, we will continue to deal with the stigma of not having a terrible disease, our cries are out of pity, our downs being called helplessness and our moments of depression being called selfishness. These are things that are so far from the truth that everyone should know and we deserve the right that they should know. Our cries are for our reality, a reality that is tough but even through it all we never give up the fight. 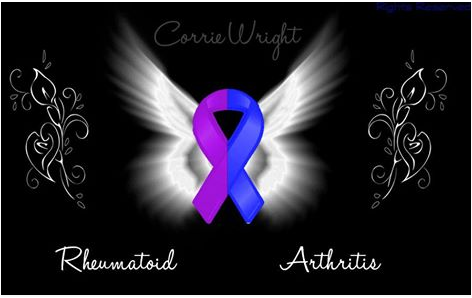 We are fighting for hope of what Rheumatoid Arthritis is and what is does and until it is understood it will continue to be a disease that monopolize our lives, the sufferers in a way that is already as harsh as anything can be.